As promised, Zun managed to finish the Full version and will be distributing it via Doujin channels. If you expect to be at the event remember to shake his hand and mind the heat. If you can't attend for some reason, like not living in Japan or not having the money for the trip, you can order the cd via other channels. 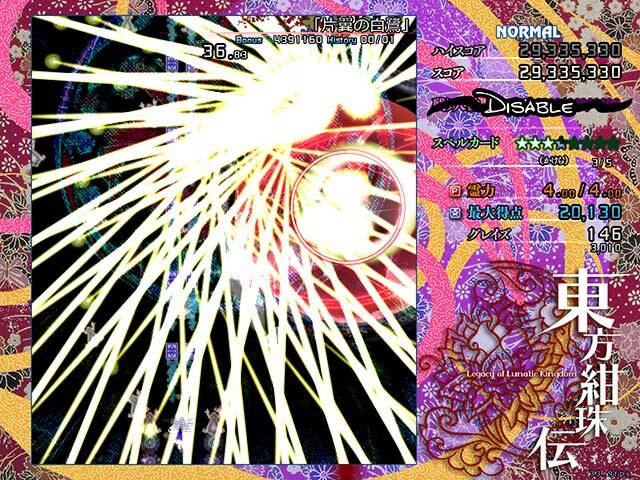 I recommend waiting for the game to appear on Playism since Touhou 14 is already there. If you prefer to play now you can try the Trail version, that Zun was kind to release. Even though it's only first 3 stages, there might be some differences between the Trail and the final version. The soldiers from the Pure Land finally made an entrance. Their flawlessness rejected the life and death of living creatures. Special trait is her shots that home in on enemies. Her hitbox is somewhat small. The Lunar Capital's Power Stone appeared before anyone knew it. It held a power that could throw Gensokyo's society into chaos. Special trait is her high firepower, both when focused and unfocused. A metallic spider appeared over the Youkai Mountain. To her, it looked like the Mars rover, Curiosity. Has a wide-range attack both when focused and unfocused. Her focused shot homes in, so you can concentrate on dodging. The only thing that can oppose the moon's power is the moon's power itself. Eirin's drug had the power to experience the future. Her focused shot uses piercing bullets. This time around there are 2 modes instead of the previous arcade one. Pointdevice Mode with infinite lives allows you to continue after death as many times as you want. However, every time you are hit you will be send a little back in the stage or at the beginning of a enemy spell card. However you will lose 0.01 power each time. On the bright side the game has a save feature that will allow you to resume from any checkpoint you ceased playing at. Legacy Mode, more familiar one with returning players, features live pool and continues much like previous games in the series. Of course you can gain more by collecting life pieces. Since the lives are indeed limited, it might be worth leaving this mode until you manage to clear the game at all. There are 4 difficulties to choose from: New Moon Level(Easy), Crescent Level(Normal), Half Moon Level(Hard) and Full Moon Level(Lunatic). The game is considered hard, even by ZUN, so don't be shy and try out all the options while playing. 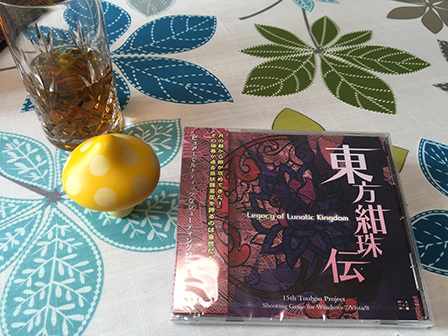 "東方紺珠伝 ~ Legacy of Lunatic Kingdom." It's read as Touhou Kanjuden （とうほうかんじゅでん）. 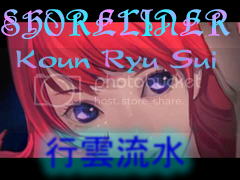 It will be completed this summer, and the demo version will be released on Reitaisai. If I had to explain the general overview of the story, it's a secret. The player characters will be Reimu, Marisa, Sanae en Reisen. Though there will still be changes, I added some screenshots of the current state of development. * The game is still in development. It's sure to change, so speculation on the basis of these screenshots is useless. On face value it doesn't look much different from normal, but this time it will have a pretty daring system. It might turn out very different from the gameplay up till now. (although the fundamental shmup components are more simple) It's a challenge that seems to go well, so I get the feeling I might somehow manage to finish the demo. I hope you can appreciate the game as a proposition of what shmup games can also look like. But if I'm honest, the completion of the demo version is still very far away, so I plan to continue development until just before Reitaisai. Which means the CD's will be home burned...... It's been longs since I had this feeling that signifies this kind of dōjin activities, so I am excited for it. Oh, furthermore, Touhou Project 14.5 Touhou Shinpiroku ~ Urban Legend in Limbo is also planned to be released at Reitaisai. If you are interested I would greatly appreciate you picking it up as well. 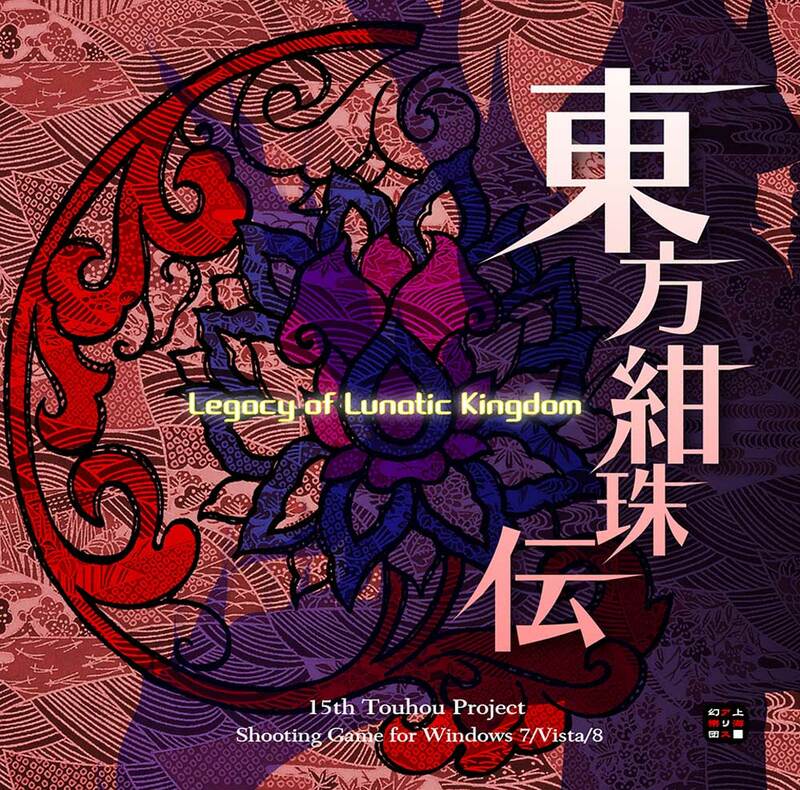 Re: 東方Project 15 東方紺珠伝　～ Legacy of Lunatic Kingdom. It turns out ZUN didn't introduce astronomy in WaHH and Udonge in FS for nothing, lol. Touhou Kanjuden ~ Legacy of Lunatic Kingdom. Demo at Reitaisai 12 (May 10). Title means roughly "Eastern Tale of the Ultramarine Orb". The titular "Ultramarine Orb" (Kanju, mandarin: gàn zhū), is a gem said to belong to Zhang Yue, a prime minister of China's Tang dynasty. When he forgot anything, he would hold the gem in his hand, and be able to remember everything. Reisen being playable is neat. Moaaaaar Stage 5! I wonder about the new characters now. Reisen appears to be holding a gun. A gun with bunny ears. I'm literally shaking right now I can't believe I'm living in a world where Reisen is a playable character. So indeed Stage 5 Boss have the larger potential becoming playable. Waiting for Shou, Orin, and Futo being playable. Seija wasn't counted cause she's already got her own game. Sanae, Reisen, Reimu as playables. So! Quick run of google translate on the text so far. - Because there are so many changes involved, the demo isn't actually finished yet. Hence every picture has a disclaimer saying it's subject to change. 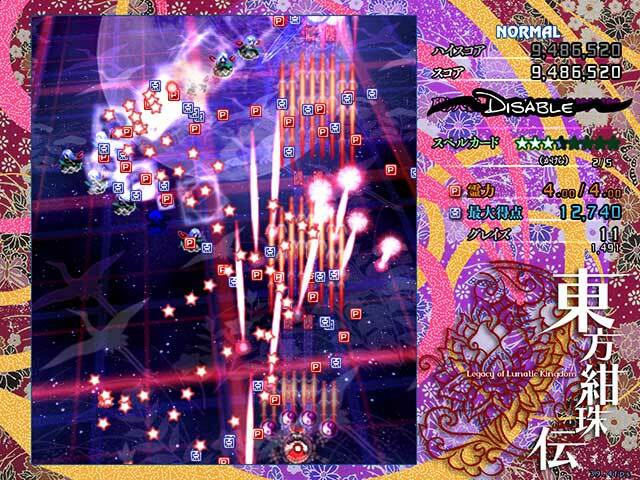 Also, Reisen's shots are called Lunatic Gun and Mind Wave, and her spellcard is Evil Undulation. This is great news! I never would've thought Reisen would be playable ( there goes the only human player characters theory~) but I'm so happy! I wonder what the disable over the life bar is going to do... maybe it's the game's gimmick or something? Reisen: Right, after I win I take your info. I didn't think it was going to happen but for once I'm glad I was wrong. 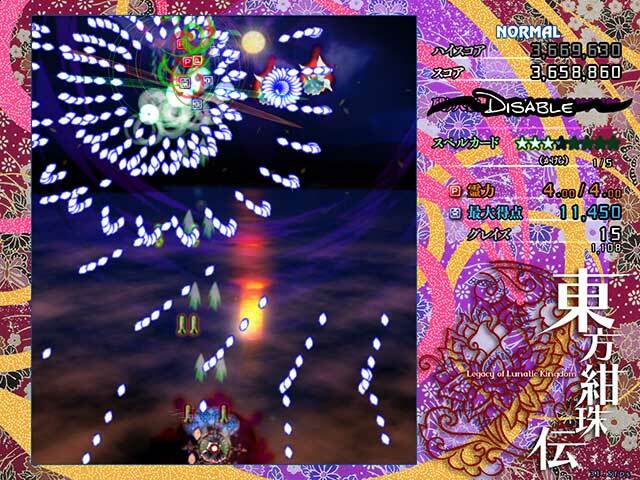 Touhou 15 2015! On another note, this breaks the supposed Phantasmagoria pattern (unless it's a Phantasmagoria with only 4 characters ¬_¬), as well as the "main game playable characters must be humans" pattern. I also noticed something regarding "chapters", so I wonder what that is about. I won't be quick to judge, but I have to say from the screenshots it looks like a fan-game in quality. And what was that a black Reisen?!? Ahaha, I guess after this the next roster will be Reimu, Marisa, Youmu, and Sakuya. Wow! New games already? Today is a good day. So, here's what I see in the screenshots. -1st picture: Lives disabled on stage and boss fight. I dunno what happens or why... I guess that is a new gimmick. -4th picture: Chapter Graze, Finished? Shooting Down? Well, looks like this is gonna be interesting. As an unrelated note, I think the characters in this game look weirder than DDC. Reisen playable, this is one of the greatest Touhou-related news I've heard. 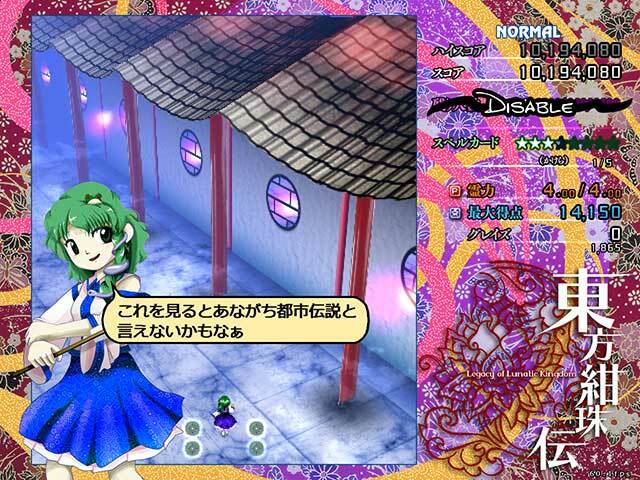 I had predicted TH15 would feature a youkai as a playable character, but a moon rabbit is fine, too. I can't wait to use that bunny gun. So a non-human is resolving an incident in a standard Touhou shooter after all. Interesting change of pace. Could also be a Last Word type deal? Will someone make a proper front page post about this? I ask because there haven't been any for the last several major announcements (14.5 and English Playism in particular, but quite a few others as well), making the front page look really outdated. So, bunny gun. This will be a meme. I guarantee it. No! what are you doing!? You've just jinxed it by mentioning her name! Can't remember if I wrote one for DDC, I think I did no? I'll write one when I obtained a physical copy of the demo so I can post proper screenshots and maybe some more explanation about the game. Currently we only have a ZUN announcement so yea this thread suffices for it. Speculations != game article. Edit: Also Cuc or mods have hijack abilities, we could improve Berzul's post. I would strongly advice this though. Depends on what Cuc is gonna do. If he has limited time I can do it tonight when I am at home. I see a Lotus Crest on the title background. Familiar designs too. Byakuren cameo incoming! Or heck, I don't mind if Shou is in instead, if that's even possible. Be my guest! Just thought this deserved more than a blog link and "Yey!" I was referring to ULiL though, which hasn't had a post at all despite there already being a demo. I understand the logic to wait a while for this one, though. Also, I checked the front page, and it turns out there was a post for DDC demo but not full. Should they have been separate posts? Except you have been betraying Reisen, like she did to her own kind, since 10D. How dare you to leave them all to their fate. Yeah, it could be but lives disabled on stage is new. Maybe there is something else other than Last Word? Reisen's always been higher than Miko, broseph. Apparently the new gameplay system is gonna require a lot of work, so ZUN will be working right up until the very last minute, and burning all the trial discs at home.